World's fastest AF speed of 0.08 sec. achieved via the integration of phase detection pixels into the advanced sensor. World's fastest AF speed of 0.08 sec. achieved via the integration of phase detection pixels into the advanced sensor. High-speed responses from the on-sensor phase detection AF system. Accurate focusing in dark scenes that only contrast AF can deliver. 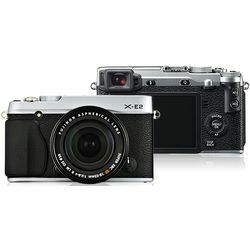 The FUJIFILM X-E2 has both, plus Intelligent.Hybrid AF for automatic switching to the optimal focusing system for the scene and conditions. A newly developed algorithm improves AF accuracy when shooting low-contrast subjects and dark scenes. The evolved AF system of the FUJIFILM X-E2 brings your subject into sharp focus so quickly that priceless moments will never escape your lens. Even more beautiful color reproduction and even higher definition image capture. The ultimate sensor, APS-C 16M X-Trans CMOS II. X-Trans CMOS II for unmatched color reproduction. Fujifilm's unique X-Trans CMOS II array eliminates the need for an OLPF, enabling the sensor to capture unfiltered light from the lens for an precedented level of resolution. Lens Modulation Optimizer technology brings out the full potential of the XF lens. Lens Modulation Optimizer (LMO) factors are calculated to compensate for aberrations and diffraction blur that occur when light passes through the lens and then are applied to produce images with amazing sharpness. Every new addition to the expanding line-up is a gem of optical excellence. very facet of the development and design of Fujifilm's original X Mount began with a clean slate. The result was the marriage of high-precision optical engineering with the latest digital technology. From the acclaimed high resolution XF lens series to the compact portability of the XC lens series, each lens exploits the full potential of the X Mount's descriptive performance. Full HD 1920 x 1080 60p / 30p, Continuous recording: up to approx. 14 min.